9. Yazoo & Mississippi Valley RR Co. 4'8½"
The famous and powerful financier and railroad builder Collis Potter Huntington set in motion the events giving birth to the Y&MV. Mr. Huntington, in his twenties, made a small fortune during the California gold rush, and at age 40 joined western capitalists to incorporate the Central Pacific RR. Completed in 1869, if formed America's first transcontinental RR, consisting of the Central and Union Pacific Railroads, and those connecting at Omaha, Nebr., direct lines diverging to the Atlantic, the Gulf of Mexico, and the U. S. heartland. Huntington next focused upon building the Southern Pacific, then consisting of many different end-to-end railroads, with wide gaps between rails, but lined up to make a Pacific Ocean to Mississippi River railroad. From the Atlantic, Huntington incorporated the Newport News & Mississippi Valley Company to build a railroad through Virginia, West Virginia, Kentucky, Tennessee, via Louisville and Memphis, in Mississippi and Louisiana, to meet his Southern Pacific “Sunset Route” at New Orleans, on the Mississippi River. The proposition began to take shape with the completion of the SP in 1881, but the eastern section was moving much slower. Nearing 70 years of age, Mr. Huntington sold most of his rail interests on the Mississippi east side. Much of it became the large Chesapeake & Ohio Ry. Other pieces were sold to the Illinois Central and the Louisville & Nashville Railroads. The part going north from New Orleans was under construction in 1882 by the Huntington-launched New Orleans & Mississippi Valley RR Co. (incorporated Sept. 17, 1881). The Daily Picayune reported Dec. 31, 1883 that trackage had extended 10 miles above Baton Rouge. (The first passenger train connecting the state's largest city with its capital, 90 miles by rail, had already run.) The NO&MV was closing the gap to join the Memphis & Vicksburg RR Co., building south from Memphis. In 1884 (August 12) the M&V and the NO&MV were consolidated with several short lines to form the Louisville, New Orleans & Texas Ry. Co., a railroad of 797.78 miles of trackage. Mr. C. P. Huntington was a director of the LNO&T. It had 101 locomotives as well as 44 passenger cars, which included a further 9 “combination” cars (part passenger, part baggage, mail, or express), 12 baggage, mail, express cars, and 3 “official” cars. Those last were mobile office, sleeping, and dining accommodations. Cars and locomotives were of all styles, ages, and conditions. Unfortunately, very few photographs exist, and practically no descriptions. As Mr. Huntington released his hold on the LNO&T, another powerful railroad builder was moving in to buy the 900 mile railroad. This was Edward Henry Harriman whose holdings included the Union Pacific, Illinois Central, even the Southern Pacific (in 1901, after Mr. Huntington's death in 1900). Control of the Illinois Central (which see) took place in 1883, setting the format in which Harriman owned both the Y&MV and the IC. Harriman was a long-time associate of Stuyvesant Fish, ICRR president. In 1892, the ICRR simply purchased the LNO&T with $5,000 in cash and $20,000,000 in gold 4% bonds of 1953 (Poors, 1895). At the time, Harriman, Fish, John Jacob Astor, and, ex officio, His Excellency the Governor of Illinois [something missing here]. The Y&MV RR Co. filed its articles of consolidation with Louisiana on Feb. 2, 1893 (ICC Valuation Docket no. 387, “decided” 6/6/1933). At the time of incorporation (1892) the road had grown to 807.27 miles of road with a roster of 105 locomotives and 76 passenger cars. While little has been recovered by research describing the earlier Y&MV passenger equipment, from the SP Co. Sacramento Shops came a new passenger coach of steel construction and modest, clean lines. This was the first of the “Harriman cars” which for decades were seen on the UP, SP, IC, and other of the “Harriman lines.” The first was no. 1806, 59'10" in length, weighing 53½ tons, with arch (elliptical) roof. Subsequent cars of this style were improved by weight cutting and eventual elimination of interior wooden appointments. The Railway Gazette of June 12, 1908, pages 83-84 portrays the car completely. The development of this important car is a highlight of John White's The American Railroad Passenger Car (see p. 59 for the SP Co. 1806 and details, photo). Y&MV trains after 1926 had ex-Vicksburg Shreveport & Pacific and Alabama & Vicksburg Rys. RR roof heavy metal construction of the teens and early twenties. A few photos are available, but little description, such as builder, when purchased, etc. All types here, wooden, wooden with steel frame, steel & wood (composite), and steel construction throughout. “Vestibule” car possibly open platform with doors close together, without metal platform cover over steps. The fascinating McKeen car appears on the Y&MV in 1910, making trial runs on portions of the ICRR and its subsidiary. The builder number was 14, road number 111. It was built in 1907 and originally was UP 14, possibly not used on the UP but a diverted order (Keilty, Doodlebug Country, Glendale, Cal., 1990 2nd printing, pp. 94, 175). A GM 200 hp engine powered the car. Body design: 12 window CE, 55', 35 tons. It gave service from ca. 1908 until scrapping in 1925. It had a sister car, no. 112 (REN 116). Motors operated on much Y&MV trackage (all motors “IC” identified). The IC had four GE/Wason motors, nos. 113-116; four Brills, nos. 117-120, then the streamlined no. 121 “Green Diamond” loco (Pullman/EMC) which operated its last years on the NO-Jackson run as the “Miss Lou”, and the four streamlined 75' cars: the original “Miss Lou”, the “Illini”, and the 2-car “Land O' Corn.” All four streamliners were rebuilt and sold to the NYS&W. The 111 gave service New Orleans to Baton Rouge at first, ca. 1910-12, and was reassigned to the Baton Rouge to Vicksburg run. The motors evoke impressions of electric interurbans, thus got some attention from proponents of electric traction's mighty interurbans. Many motors were powered by electric traction motors from generators turned by gasoline or diesel engines, so the kinship is unavoidable. 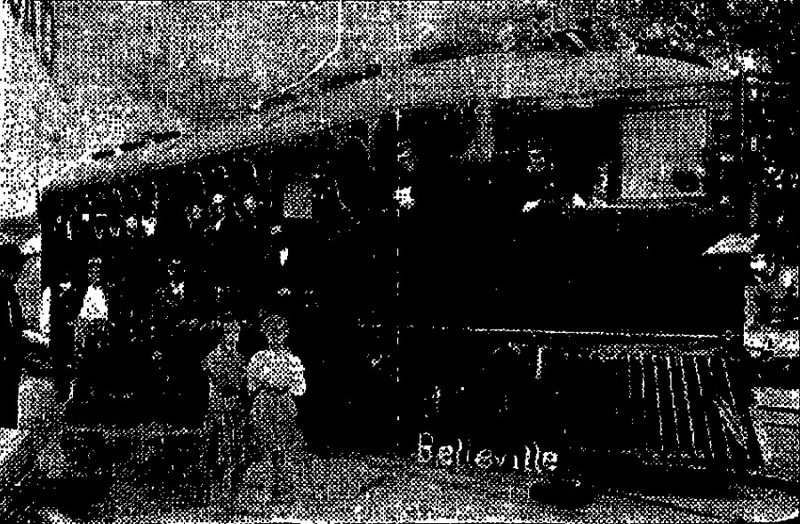 Here is a view of McKeen car 111 as it appeared in the TP, Dec. 1, 1910, p. 10. This is an earlier photo made at Belleville, Illinois. Why the TP reporter didn't make a photo of his own is not clear. The car had just made its inaugural trip from New Orleans to Baton Rouge, carrying a party of dignitaries. Unfortunately, the available print is much too dark, but one can make out the pointed front end and the round “porthole” windows, each filled with a face eager to be seen in the newspaper. According to the TP, the car seated 50. It was to begin a regular daily round trip between the City and the capital.